Here’s a question which pops up regularly in Thorpe Bay: “Stump grinding, what does that involve?” Well, it’s to do with grinding a tree stump out to a depth of around 6-12 inches below ground so that the space where it was growing becomes hazard free. Our constant investment in the latest equipment ensures that we can offer the best possible stump grinding, Thorpe Bay wide, service. 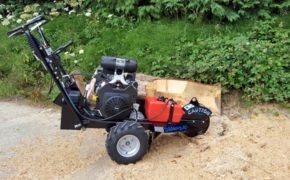 We use a specialist stump grinding machine which can fit through narrow entrances, up to those as small as 29 inches. Access can sometimes be limited in properties in Thorpe Bay. Tree stump removal, however, is not a problem when using our advanced machinery. Do you need to remove a tree stump? Thorpe Bay homeowners can make the most of their gardens and land with our help. We can even aid you in paving the way for the likes of extensions once the health and safety hazard that is a protruding tree stump is removed. Call us for a no obligation estimate and you will be delighted with our prices which are some of the most competitive around. Their position within your garden or land, for example, are they next to a building? In a wooded area? On a slope? How access is to be gained to the tree stumps, for example, via your neighbour’s garden, directly from the road over a hard driveway, through a paddock, or perhaps up a bank. Stump grinders are either manually pushed or can be self-propelled. We use the self-propelled version due to its great power and superior action. Once the tree stump has been ground out it is chipped up and we then use the chips to fill in the hole. We’re well known in the area for our oak tree stump removal Thorpe Bay wide. The most common tree in Britain is the English oak, and it’s probably the most well known, too. Referred to by its Latin name of Quercus Robur, the oak tree will often grow to heights of more than 20 metres and can grow up to 40 metres. Despite their height and the fact that they have wide canopies with strong branches, our expertise in oak tree stump removal Thorpe Bay wide and our state of the art equipment mean that no English oak job is too large. Willow trees can grow up to in the region of 10 metres and are known for their long lifespans of up to 300 years. With approximately 400 species of willow tree, or to give them their Latin name, Salix, meaning ‘sallow’, expert knowledge is required when it comes to willow tree stump removal. Thorpe Bay residents can trust in our extensive experience as qualified tree surgeons and know that a willow stump will not prove a difficulty for us. Be reassured that our experts are well known for dealing with willow tree stump removal Thorpe Bay wide. Often growing to towering heights of up to 100 metres, the Latin name for the conifer tree is Pinophyta. There are numerous types of conifer which include yew, pine, cypress and Douglas fir. Regardless of how tall the trees are and whether you have a conifer hedge or a single tree, it won’t be a problem for us to carry out the felling and tree stump removal. Thorpe Bay residents can depend upon our knowhow to safely handle the work and you’ll be left with a nice flat piece of land. The evergreen eucalyptus tree can flourish with expert attention such as coppicing and pollarding. Suitable for small gardens as long as they are regularly pruned, Eucalyptus trees can grow fairly tall and wild and will readily shed bark and branches if left to their own devices. If you have a eucalyptus tree stump that needs removing in Thorpe Bay, let us help. Our eucalyptus tree stump removal service is available Thorpe Bay wide with all jobs are undertaken with the utmost safety considerations in mind and at a competitive cost, regardless of the size of the tree or whereabouts it is situated. Restricted access can’t even put us off; we can even remove eucalyptus tree stumps with minimum access thanks to our specialist equipment. Cherry is part of the Prunus family of trees which includes a variety of fruit bearing species across Europe. Producing delicious fruit and beautiful cherry blossom, cherry trees are well known for growing outwards and upwards for a good 10 metres, which means that they can quickly and easily become unmanageable. Although beautiful, they tend to need a lot of attention, which is why a lot of people opt to have them removed, leaving just the stump. If you have a cherry tree stump on your land that’s proving to be in the way, we can remove it safely and cost effectively thanks to the knowledge of our specialist Thorpe Bay cherry tree stump removal experts. A UK native species, the silver birch tree – or the Betula Pendula in Latin can grow up to heights of 30 metres. They tend to maintain a light canopy, and other plants like to grow next to the silver birch because its deep roots act as a channel for otherwise inaccessible nutrients. These deep roots however may lead to it proving a challenge to deal with silver birch tree stump removal. If you engage T.H. Tree Services and their specialist expertise, however, you’ll find that silver birch tree stump removal Thorpe Bay wide is no match for us. The ash tree, of the Latin Fraxinus Excelsior, is a UK native species. With an impressive lifespan of up to 400 years, you may be surprised to hear that with professional care, this tree can live longer still. The ash tree is known for its slender elegance as it can grow up to 35 metres. It’s common for them to grow in groups so that a domed canopy forms. If you have an ash tree stump to remove in Thorpe Bay – or perhaps more than one stump to remove – you can depend upon on the knowhow of the tree surgeons at T.H. Tree Services to carry out the job professionally, safely and at a competitive cost. Part of the family Prunus Domestica, which also produces the tasty damson and greengage fruits, plum trees are not native to the UK but are still fairly prevalent. They are quite short trees, not really growing to great heights, and are typified by straight branches and spiny twigs. We can assist if you have a plum tree stump to remove in Thorpe Bay. Our qualified Thorpe Bay plum tree stump removal specialists are happy to offer a safe and cost effective service. Cedar trees are evergreen conifers. These beautiful and stately trees are originally native to the Lebanon, eastern parts of the Mediterranean and parts of Asia, but have become fairly common in recent years within the UK. Of the Latin Cedrus Libani, the cedar tree is known for its wood that acts as a natural insect repellent. Cedar trees are distinguishable by their multiple trunks and can grow to heights of in the region of 35 metres. The certainly have an unusual shape, although this is no issue for our Thorpe Bay cedar tree stump removal experts who have the knowhow, expertise and experience to handle taking out a cedar tree stump of any size. Pine trees come in a variety of species with the Scots pine being one of the most common and one of just three native to the UK. Pinus Sylvestris as it is known in Latin have long lives of up to 700 years, growing to a height of up to 35 metres within that time. Despite this great height, the specialist Thorpe Bay pine tree stump removal experts at T.H. Tree Services are able to offer pine tree stump removal with complete peace of mind where satefy is concerned. Even for stumps where the tree was particularly tall and laid down extensive roots, we have the manpower and experience to remove the stump effectively and swiftly. There are a number of factors that can affect the cost of stump grinding. Thorpe Bay wide we have to advise our potential clients that the size of the stump will affect the price, as will the fact that hardwood trees require a different approach to softwood trees. However, you can enjoy the peace of mind that you’ll receive the best rates for tree stump removal in Thorpe Bay when you instruct the services of T.H. Tree Services. Local authority and Trading Standards approved, we are insured for all Thorpe Bay stump grinding and have machinery suitable for tree stumps measuring 2 inches to 4ft and up to 1ft deep. For tree stump removal in Thorpe Bay with best rates guaranteed, call T.H Tree Services on 01268 642 814.